These exclusive Navy documents outline plans for combat training exercises along vast areas of Washington State coastline. Each shows the areas the Navy is prepared to utilize. Beginning in mid-January, Navy SEALs will be practicing unannounced and clandestine combat beach landings across Washington State’s Puget Sound and many other coastal areas of that state. The simulated combat exercises, which will include the use of mini-submarines and other landing craft, will deposit Navy SEALs carrying « simulated weapons » on 68 beach and state park areas in Puget Sound, the Strait of Juan de Fuca and Washington’s west coast, unbeknownst to most of the relevant government agencies tasked with overseeing these areas. Internal Navy emails, two slide shows (which can be viewed in full here and here) and other documents obtained exclusively by Truthout reveal the vast extent of the operations. They also reveal the fact that the Navy labeled the relevant files as « For Official Use Only » and emails as « Attorney-Client privilege, » a move that exempts such documents from the Freedom of Information Act (FOIA). In the new scenario, which the military calls « realistic military training, » Navy SEALs carrying « simulated » weapons may also travel across public and private property within city limits, and may swim through public and private marinas occupied by people living on boats. They could conduct war game patrols on roads through residential communities. In addition to tribal, state, federal and county lands, there are many properties on the Navy’s list of training sites marked as private. Across Washington, the Navy’s upcoming war game exercises, which are slated to begin January 14, will be carried out across 68 beach areas around the state, many of which lie within the boundaries of state parks. Many of these beaches are popular with the public and contain campgrounds and marinas. According to maps in the two slide shows Truthout obtained, Navy SEAL activities will occur well inland from the beaches. Each site for the exercises will be « utilized » two to eight times per year, and « events » can last between two and 72 hours. Naval maps of the areas where the exercises will occur show large areas where « surveillance and reconnaissance » will occur, along with « direct action » areas and « insertion and extraction » zones. According to the documents, a « safety » buffer of 500 to 1,000 meters will also be maintained by a Navy support team in boats, vehicles and on foot, which will prevent bystanders from entering the areas. This amounts to periodic closings of public land, including state parks and fishing areas, with no public comment periods or government oversight. Given that some of the exercises will entail Navy SEALs swimming through marinas where people live on their boats, along with exercises and patrols through residential neighborhoods and private land, maintaining a « safety » barrier of 500 to 1,000 meters simply does not seem possible. One of many areas slated for direct actions in the Navy’s plans is Fort Worden State Park, on the northeast tip of the Olympic Peninsula. The Navy has designated a large area atop a hill there – a place that contains popular public trails and picnic areas – for its war exercises. The hilltop location includes a seating area for quiet contemplation, called Memory’s Vault, which is referred to as a « peace park. » The public in the area will likely interpret the Navy’s use of this portion of the park as another of the many gestures of contempt they have seen from the military. According to Karen Sullivan, former assistant regional director at the US Fish and Wildlife Service’s Division of External Affairs and a retired endangered species biologist, the Navy’s actions are also illegal. Sullivan has worked in the division for over 15 years, and is an expert in the bureaucratic procedures the Navy is supposed to be following. According to Sullivan, the Navy’s actions are a violation of several laws, including the National Environmental Policy Act, Administrative Procedures Act, National Historic Preservation Act and possibly others, as well as a violation of the public trust doctrine. In one example, the Navy, without any consultation with the State of Washington, recently concluded that the war games would have no effect on historic and cultural properties – including those belonging to Indigenous tribes – and therefore there was no need to consult with the State or with tribes on the new sites for 2016. Sullivan expressed deep concerns about the exercises the Navy has planned for Washington coastlines and the communities near them. Connie Gallant is the board president of the Olympic Forest Coalition, a group that promotes the protection, conservation and restoration of natural forest ecosystems and their processes on the Olympic Peninsula. Like Sullivan, she agrees that while the military needs to train, the methods the Navy is employing across Washington are unacceptable. « Navy SEALs must be well-trained for any situation, » she told Truthout. Gallant sees the use of Fort Worden State Park in particular as an egregious example of what the Navy’s exercises can do to a once-pristine area. Truthout has reported extensively on the wide-scale negative impacts the Navy’s war gaming has had, and will have, on wildlife around the region. Nevertheless, the Navy is poised to move forward with its exercises, and according to Sullivan, it is doing so using nefarious, illegal methods. The Navy is using an exemption process called a categorical exclusion (CATEX) as a means of sidestepping federal regulations that could prohibit its use of these areas for exercises. According to an email obtained by Truthout, the Navy intends to issue its own CATEX on some of the SEAL activities as a means to segment and hide the full scope of its actions. Other communications have revealed that the Navy will retrofit an EA for the big action but will continue to CATEX pieces of it to keep it going. The Navy’s method essentially ensures that it will get its way, as there is not going to be time for a full and legitimate EA and public process period between now and mid-January (in just a few days), when it begins its exercises for at least the second year in a row. A glance at the Code of Federal Regulation citation for this shows that the Navy’s actions are anything but uncontroversial, or consistent with federal, state or local laws. They certainly do not fall into the categories of public transportation, emergency utility repairs or improvements to existing rest areas and weigh stations, for which categorical exclusions were originally intended. Hence, in the case of these upcoming exercises across Washington State coastlines, the Navy is issuing its own categorical exclusions for a massive amount of covert training in civilian-populated areas. By doing so, it is circumventing state, local and possibly federal governments by concluding « no significant impacts » in its own assessments – and it continues to proceed in secret. 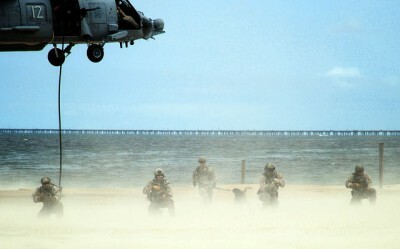 Hence, according to that definition and according to the US military’s Special Operations Command (SOCOM), the RMT process is theoretically designed to ensure coordination between US Department of Defense representatives and local and regional officials in the areas where their exercises are to be conducted. Steps like risk assessments, medical plans, surveys of training areas and coordinating their activities with local, state and federal law enforcement officials are supposed to be mandatory. However, in the Navy’s upcoming coastal exercise, not one of the measures listed by SOCOM has been offered to the public or to local or state officials in Washington, and no publicly availabledocumentation exists that such measures have ever been considered. Yet, many of the areas outlined in the Navy’s documents for their upcoming exercises take place in populated areas, on developed land. Well over 100,000 people live on the Olympic Peninsula alone, and Olympic National Park hosts 3 million visitors per year. « This is particularly galling with Navy SEALs about to conduct insertions, extractions, launch and recovery, special reconnaissance and other activities with ‘simulated weapons’ in populated areas without the knowledge of the public, » Sullivan said. There are numerous other RMT-type events that have occurred around the United States in recent years, including « urban » training events in various communities around the country. A December 2015 US Army report titled « Intelligence Support to Urban Operations » addresses challenges facing military action in an urban environment. « With the continuing growth in the world’s urban areas and increasing population concentrations in urban areas, the probability that Army forces will conduct operations in urban environments is ever more likely, » the manual states. Clearly, the Navy’s training in Washington is also focused along these lines as well. Military training for combat in urban environments, like the Navy’s upcoming exercises in Washington, has been ongoing at bases around the country, with the goal of preparing soldiers for close-contact engagements within urban environments. As recently as March 2015 in South Carolina, Operation Vigilant Guard saw large deployments of troops in civilian areas for training. Sullivan sees these actions, and in particular the upcoming naval exercises across Washington State, in an insidious light. « The real story here is the fact that kill teams in training will be conducting covert operations in and around residential communities and on public lands without our knowledge, » she said. Sullivan believes the general public needs to be concerned about the Navy’s actions, along with the ongoing domestic military expansion as a whole, because they both present « an unprecedented and unlawful taking of public and private space for military activity. » She points out that there is no plausible justification for the Navy’s incursion into urban areas. Like Gallant, Sullivan is not opposed to the military conducting trainings, in itself. She objects to the training happening in places where people live, work and recreate, and without the informed consent of the public. « We object to the shell game that has passed for public process, » Sullivan said.